This morning's red post collection includes new longer form champion introductions & backgrounds for Fiora and Kindred, Meddler on the marksman champion & item changes coming in preseason, & more! Red Post Collection:Data & Champion Balance, FeralPony/ Zenonthestoic ask.fm roundup, & more! 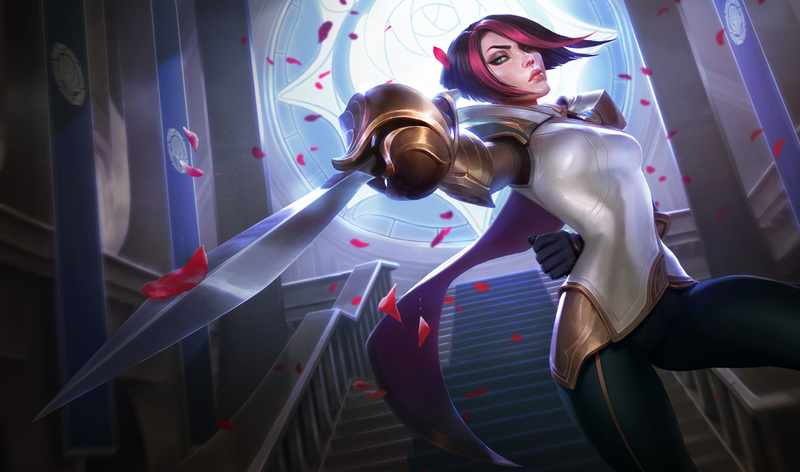 Fiora's champion page on the League of Legends website has been updated to include her new longer form champion introduction & background! From an early age, Fiora defied every expectation placed upon her. Her mother had the finest craftsmen of Demacia fashion the most lifelike dolls for her. Fiora gave them to her maids and took up her brother's rapier, forcing him to give her lessons in secret. Her father obtained a host of dressmaking mannequins for her personal seamstress to craft wondrous dresses. Fiora used them to practice lunges and ripostes. At every stage in her life, Fiora has embodied all that is noble in Demacia, striving for perfection in all things and brooking no insult to her honor or that of her family's ideals. As the youngest daughter of House Laurent, she was destined for a life as a political pawn, to be married off in the grand game of alliances between patrician houses. This did not sit well with Fiora, whose temperament saw only dishonor in being maneuvered by another's will, even that of her beloved father. Despite her resistance, a politically advantageous marriage was arranged with an outlying branch of House Crownguard, and plans were set for a summer wedding. The ancient families of Demacia sent their invited representatives to House Laurent to attend the marriage ceremony, but instead of meekly accepting her fate, Fiora defied it. She declared before the assembled host that she would sooner die than be dishonored by allowing someone else to control her fate. Her husband-to-be was publicly shamed and his family demanded a duel to the death to wipe away Fiora's scandalous insult. Fiora immediately stepped forward, but as Master of House Laurent, it was her father's duty to accept. The champion of House Crownguard was a truly deadly warrior, and defeat was almost certain. To lose would see House Laurent ruined and his daughter exiled in disgrace. Presented with so stark a choice, Fiora's father made a decision that would damn his family for years to come. That night, he attempted to drug his opponent with a draught to rob his blows of speed, but his attempt was discovered and the Master of House Laurent was arrested. Demacian law is notoriously harsh and unforgiving. Its justice allows no leeway, and Fiora's father had broken its most fundamental code of honor. He would suffer public humiliation upon the executioner's scaffold, hanged like a common criminal, and his entire family expelled from Demacia. On the eve of his death, Fiora visited her father's cell, but what passed between them is a secret known only to her. An ancient and all but forgotten code of honor allowed for a family member to expunge the shame of one of its number in blood, and thus avoid the virtual death-sentence of exile. Knowing they had no choice, father and daughter faced each other within the Hall of Blades. Justice would not be served by a mere slaying, Fiora's father had to fight and be fought. The battle was blindingly swift, a dance of blades so exquisite that those who witnessed it would never forget what they had seen. Fiora's father was a fine swordsman in his own right, but he was no match for his daughter. They said farewell in every clash of the blade, but in the end a tearful Fiora buried her rapier in her father's heart and assured her family's continued place in Demacia. With her father dead at her feet, Fiora became the head of House Laurent (much to the surprise of her older brothers...). Though the honor of House Laurent was not entirely ruined, scandals are not easily erased. In the years that followed, Fiora proved a sagacious leader of her House and swiftly learned not to make the mistakes of brash youth. She became a formidable mistress of blade and negotiation, cutting to the heart of any matter with her customary clarity and seemingly cruel directness. Some still speak of her House's disgrace or decry how standards have fallen that a woman should dare call herself ruler of a noble House, but only in private. For when such gossip reaches Fiora's ear, she is quick to call out those rumormongers and demand justice on the edge of a sword. Yet even here, she is not without pragmatic cunning, offering each challenger a way out that will allow honor to be satisfied without death. So far, none have accepted her offers, and none have ever walked away from a duel with Fiora. With the fortunes of House Laurent on the rise, Fiora has no shortage of suitors, but none have yet proven worthy of her hand. Many suspect Fiora herself puts every suitor through an impossible gauntlet of courtship in order to remain aloof and unmarried, for a wife would, traditionally, relinquish power to her husband. And Fiora has never done anything traditionally. The man Fiora was going to kill was named Umberto. He had the look of a man very sure of himself. She watched him talking to four men, so alike they must surely be his brothers. The five of them were cocksure and preening, as though it was beneath their dignity to even present themselves in the Hall of Blades in answer to her challenge. Dawn's light cast angled spars of light through the lancet windows, and the pale marble shimmered with the reflections of those who had come to see a life ended. They lined the edges of the hall by the score, members of both Houses, lackeys, gawkers and some simply with unhealthy appetites to see bloodshed. “If I let one braggart slide, then others will think themselves free to wag their tongues,” said Fiora. Fiora stepped forward, rolling her shoulders and sweeping her blade twice through the air – a sign the duel was about to begin. Umberto turned as one his brothers nudged him in the ribs, and anger touched Fiora as she saw his frank appraisal of her physique, an appraisal that lingered far too long below her neck. He drew his own weapon, a long, beautifully curved Demacian cavalry saber with golden quillons and a sapphire inset on the pommel. A poseur's weapon and one entirely unsuited to the requirements of a duel. Umberto stepped up to his duelists' mark and repeated the sword movements she had made. He bowed to her and winked. Fiora felt her jaw tighten, but clamped down on her dislike. Emotion had no place in a duel. It clouded swordplay and had seen many a great swordsman slain by a lesser opponent. They circled one another, making the prescribed movements of foot and blade like dance partners at the first notes of a waltz. The movements were to ensure that both participants in the duel were aware of the significance of what they were soon to attempt. The rituals of the duel were important. They, like The Measured Tread, were designed to allow civilized folk to maintain the illusion of nobility in killing. Fiora knew they were good laws, just laws, but that didn't take away from the fact that she was about to kill the man before her. And because Fiora believed in these laws, she had to make her offer. “Good sir, I am Fiora of House Laurent,” she said. “Save it for your grave-marker,” snapped Umberto. “How might I give milady satisfaction?” asked Umberto. “Of course there is,” said Umberto, and Fiora saw he still thought he could win. Like everyone else, he underestimated her. His anger at what he assumed was her arrogance overcame his fear and he stamped forward, the tip of his sword thrusting for her heart. Fiora had read the attack before it was launched and made a quarter turn to the left, letting the curved blade cut only air. Her own blade swept up, then down in a precise, diagonal arc. The crowd gasped at the wet spatter of blood on stone and the shocking suddenness of the duel's ending. Fiora turned as Umberto's sword clattered to the granite flagstones. He fell to his knees, then slumped back onto his haunches, hands clutched to his opened throat from which blood pumped enthusiastically. She bowed to Umberto, but his eyes were already glassy and unseeing with impending death. Fiora took no pleasure in such a slaying, but the fool had left her little choice. Umberto's brothers came forward to collect the corpse, and she felt their shock at their brother’s defeat. “There will be more,” promised her brother. “Redemption for whom?” asked Ammdar. But Fiora did not answer." "The Narrative team did a really good job on this one. I remember sitting down with them as they were sketching her story out and being very inspired. Felt amazing to work on a character with this much attitude and badass-ness. Also, Foundations, the team that helps us build out our world, did a really good job helping us bring more up-to-date fashion sensibilities and motifs to Fiora. A lot of why we chose to change her base look revolved around the new emerging aesthetics of Demacia. Clean shapes, high-end materials, over all quite sleek. Very intentional choices to bring her in line with a faction which we felt was solidifying nicely. A refreshing change from more traditional high-fantasy kingdoms." 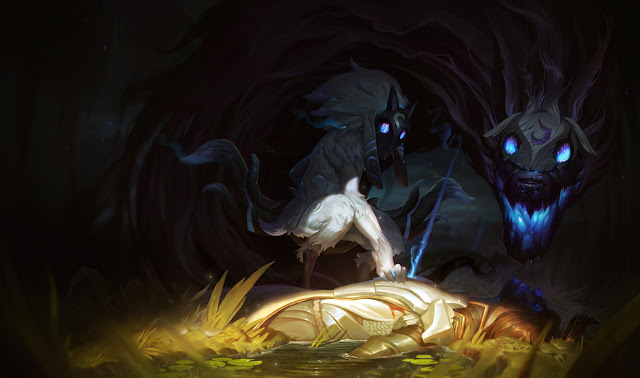 With their upcoming release in 5.20, Kindred's champion page has been added to the League of Legends website and includes their long form champion introduction & background! There is also a new related content headline that will take you to the A GOOD DEATH short story! In case you missed the news, Kindred has been delayed until 5.20 (which should be next week, ~10/14!). Around the release of the Juggernaut updates, there was mention of similar level updates aimed at both Olaf and Shyvana. When asked if this was still the plan, Meddler has commented that they no longer plan to push these reworks for Olaf & Shyvana . "We were previously looking to do work on both Shyvana and Olaf in the preseason. We came to the conclusion both were in fairly reasonable spots though and that we'd be better off putting that time into other champions instead, at least for now." In boards thread asking when we can expect the previously announced marksman champion & item changes, Meddler commented they will be coming in preseason! "Marksmen changes (both kits and items) will be coming in the preseason (at least a couple of patches after 5.20). We're not quite ready to talk about all the details of that yet, still sorting out exactly what will and won't be included. At a guess we should be ready to share details just after Worlds finishes, possibly slightly before." "Some things will ship in the preseason. Some things will prove to be good ideas that need more time, so they'll get delayed. Some things won't work out as hoped and will get scrapped." "This will be gameplay driven updates. There'll be a few visual modifications to support kit changes, but nothing that qualifies as a visual upgrade. Think the same sort of levels of art adjustments as the juggernaut changes in 5.16."